Recent science and testimonials demonstrate hyperbaric oxygen treatment (HBOT) to be an effective modality to increase blood flow and oxygen to the impacted areas of the brain. 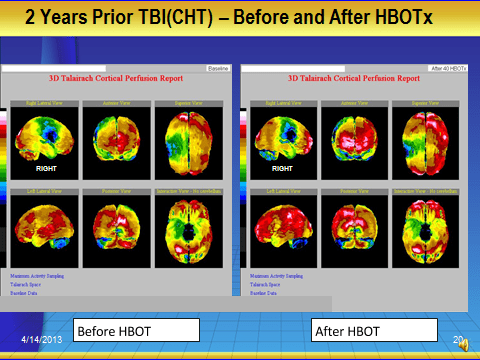 Through neuroimaging, we can see the difference HBOT has on the biology of the brain. But the patients and caregivers also report profound quality of life improvements — particularly when HBOT is combined with NILT. The brain is easily “injured” by stroke, direct physical injury, infections, inflammation, degenerative processes, and toxic substances. Often we chose our toxins for recreational purposes. Whatever the cause, if a brain cell is injured, the brain cell may not be able to function. The cell may still be alive, but unable to perform its primary functions of electrical signaling or neurotransmitter production. Brain cells must live moment to moment. The brain is unable to store nutrients. There is no room in the skull for fat stores. Thus, the brain must have them continuously delivered via the bloodstream. Glucose and oxygen are distributed to individual brain cells in a precise manner. Brain cells with greater activity have a greater need for oxygen and energy and the bloodflow to these cells is higher. Weakened brain cells can no longer muster the energy required to extract the oxygen they need. This is where hyperbaric oxygen comes in. With hyperbaric treatment, the oxygen is delivered directly to tissue. The levels of oxygen diffusing within the fluid of the blood and in the fluids surrounding a brain cell are increased. This promotes the cell’s recovery to a fully operational, neuron interacting with other brain cells. When combined with NILT, the impact on a damaged or injured brain can be profound. Not only, do the brain cells make more energy because their mitochondria are activated by the NILT to produce more energy, but more oxygen is being delivered to support these healing brain cells. Stroke and brain injury patients have enjoyed a significant degree of brain function improvement with HBOT therapy. In many cases, progress was made even when treatment started three or four years after the injury and all other therapies have been tried. It’s noteworthy, that these results were achieved with HBOT alone, and did not involved other concurrent combination of therapies. One major improvement has been a significant reduction of stress experienced by the caregivers! Hyperbaric oxygen treatment has been explored as a treatment for TBI. The most carefully performed study compared a group in a cross-over design with both an interval of null treatment and of hyperbaric oxygen at 100% oxygen and 1.5 atmospheres (Boussi-Gross et al). They described improvement in many of the symptoms associated with persistent TBI including headache, tinnitus, vision disturbance, memory dysfunction, and impaired cognitive function. Cognitive testing also showed improvement in attention, information processing speed, and a battery of cognitive tests. In an uncontrolled case series of 16 subjects, Harch and colleagues demonstrated that an abbreviated series of hyperbaric treatments using 100% oxygen at 1.5 atmospheres could mitigate subjective symptoms of TBI (e.g., headache, sleep disruption, irritability), improve cognitive testing scores, and improve cortical function based on SPECT imaging. Hyperbaric oxygen remains a controversial area in both acute and chronic TBI, but many patients have remarked about its effects. With all brain dysfunctions, HBOT addresses both the primary brain dysfunction factor, as well as the underlying and co-occurring morbidities in the brain. Using brain SPECT imaging we get an inside look at the functionality of the brain and injured areas. Then, we can measure the effectiveness of treatments addressing all of the co-occurring morbidities. See chart below. For example, below you have a SPECT scan of a brain before and after receiving 40 HBOT treatments. The black area on this pre-HBOT SPECT study represents the focal stroke area in the right frontal cortex. There were other co-morbid variables of dysfunction, demonstrated by areas of both increased and decreased function in the left side of the brain, all of which were ignored clinically, until visualized by SPECT imaging. The patient received 40 treatments of HBOT therapy, which resulted in clinical improvement brain function.